An Economy 10 tariff is a type of tariff that enables you to pay two different rates for your electricity – a cheaper one for the energy you use during periods of low network demand, and a more expensive one for the electricity you consume during peak hours. It is an example of a Time of Use tariff, which defines any deal where customers are charged different rates for electricity at specified times of the day. The other Time of Use tariffs include protected multi-rate tariffs and the more popular Economy 7 tariff. As the Economy 10 tariff is not as widely available as those for standard and Economy 7 meters, it can be difficult to compare and switch to a cheaper deal, mainly due to the reduced number of tariffs available. The following is a short guide to comparing, switching and managing an Economy 10 tariff. The Economy 10 tariff is designed to help households save money on their electricity bills through designating off-peak hours in which they pay a lower price for their electricity. While the Economy 7 provides seven consecutive hours of off-peak electricity during the night, the Economy 10 tariff provides ten hours of off-peak electricity split between afternoon, evening and night. Three hours in the afternoon, four hours in the evening and three hours in the early morning . Three hours in the afternoon, two hours in the evening and five hours overnight. The time periods relevant to you can differ depending on your location and local distribution network operator – ask your supplier if you’re unsure about the periods during which you get cheaper electricity. It’s common for the time periods to be locked to either GMT or BST when the Economy 10 meter is installed. However, some meters use a radio teleswitch – controlled by the supplier – so they can take into account Daylight Saving Time, while some meters automatically adjust themselves when the clocks change and others need to be manually adjusted. You’ll need an Economy 10 meter if you want to be on an Economy 10 tariff. An Economy 10 meter is able to measure the amount of electricity you consume during each of your designated off-peak times. Economy 10 meters are slightly more complex than standard single-rate ones, as they produce either two or three separate readings depending on your electricity provider. 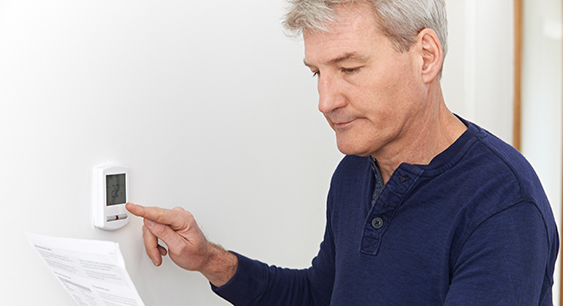 For the former, your meter will usually display two rates – a normal rate and a lower off-peak rate. If your meter involves three readings, these are usually split into day/normal usage, night/low usage and day/off-peak usage. Your meter should either have a button that allows you to scroll through the different readings or a digital display that will automatically cycle through them. You’ll need to submit all the readings to your supplier who can then determine the collective costs when creating your bill. If you’d like an Economy 10 meter for your home, you may need to pay to have it installed. Is the Economy 10 tariff right for me? They are an all-electric household that does not use gas for energy. They have electric wet radiators, underfloor heating or storage heaters, which allow heat to be retained and then released as the day progresses. A timer is used to switch the heating on and off in conjunction with the off-peak times. They use at least 20% of their energy during the specified off-peak times. They are disciplined about their energy use, and can develop and stick to a routine. They leave the home vacant during the daytime and use most of their energy at night – while benefiting from the flexibility of an additional off-peak period during the afternoon. They have timers on major appliances such as the washing machine, tumble dryer and dishwasher so they only turn on during the off-peak periods. They do not have an older storage heater – these tend to require seven hours of continuous heating to store enough heat, which is not possible with an Economy 10 tariff. When factoring in costs, you’ll also need to consider that the standing charges for Economy 10 tariffs are often higher than that for other tariffs. At present, it is not possible to use price comparison sites to switch between Economy 10 tariffs, mainly because the meter is slightly more complicated. If you’re thinking of switching suppliers, you’ll need to contact them directly to discuss a switch. Not all energy suppliers offer Economy 10 tariffs – or accept new customers for Economy 10 – so this is the first thing you’ll need to find out. Once you’ve contacted a few – or all – of the suppliers offering Economy 10, you can then compare the prices they’ve given you and arrange to switch to your chosen supplier. Whether you’re switching to or from an Economy 10 tariff, suppliers often impose a charge to change the meter. If you’d like to switch between suppliers, you may need your meter reprogrammed by an engineer as the off-peak times can vary between suppliers. With the introduction of new smart meter tariffs, you may find that suppliers begin to phase out Economy 10 tariffs as they begin to better understand their customers’ energy consumption habits. If you’re looking to switch away from Economy 10 entirely, you’ll probably need to pay for the installation of a standard meter. The first thing you’ll need to do is to compare the entire energy market and switch to the most appropriate deal for your household. Once this is done, your new supplier should arrange for a new meter to be installed. An alternative option could be to convert to a standard Economy 7 tariff while keeping the Economy 10 meter – this broadens the pool of suppliers and tariffs from which you can choose to make comparisons. This means you’ll still have peak and off-peak readings, but you’ll only get seven hours of the cheaper rate. As with regular fixed tariffs, you may be charged a cancellation fee if you choose to cancel the tariff before its expiration date.